Four years in the making, UW-Stout has recently published a comprehensive, yet readable, history of its first 125 years. 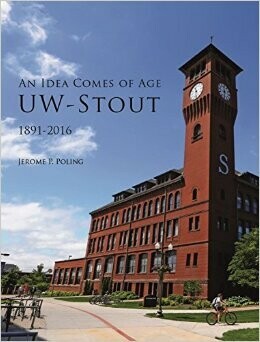 An Idea Comes of Age: UW-Stout, 1891-2016 was written by Jerome Poling, assistant communications director for UW-Stout’s University Communications. “Even though I have spent nearly three decades at UW-Stout, I found this book fascinating and enlightening,” said Chancellor Bob Meyer. “I know anyone who cares about UW-Stout will want a copy.” Poling said his goal in writing An Idea Comes of Age was two-fold. “One was to chronicle how UW-Stout came to be and how it grew and changed over the decades. That in itself is a fascinating progression. It opened as two-room private school. It’s now a state-owned university – the only one named after a person – with more than 40 buildings on 124 acres. The other, more challenging goal was to dig deeper and find out who and what drove the changes.” The book covers the history of UW-Stout from its founding by James Huff Stout as Stout Manual Training School. An Idea Comes of Age, published by Thomas-Shore of Michigan, is available at The Local Store, 205 N. Dewey St., Eau Claire, and can be ordered online through the Seattle Book Company or Amazon.